Membership in the National Audubon Society grants you membership in your local chapter. Membership benefits include a subscription to Audubon Magazine and The Lesser Squawk. The simplest way to join is via the National Audubon Society website where you may pay via credit card on their secure site — please be sure to select the Charleston, SC chapter (U-51) as your local chapter. 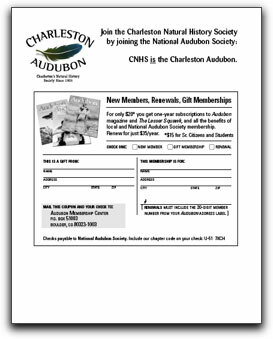 If you wish to pay by check, you may download a copy of our membership form below and mail it to the National Audubon address on the form. If you are a current member and have your membership number available, you can contact Audubon customer service by phone or email and make changes to your account, request a missing issue, etc. Download and print a membership form you can mail with a personal check.